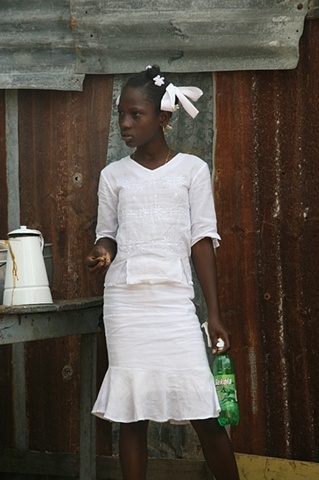 Brooklyn, New York – October 2012 – Régine Romain is pleased to announce Portraits for Self Determining Haiti, is included in the “Photography Works” show at Clover’s Fine Art Gallery. Six portraits are on display from the full traveling exhibition of photographs. Régine Romain photographs and researches Haiti’s shifting yet distinct presence throughout the world in an ongoing visual diaspora project. Her work is grounded in individual and community portraiture. This exhibition bridges two compelling views: Romain, the daughter of Haitian immigrants, as the composer of portraits on Haitian life rarely seen, and the reality of Haiti as a self-determining nation – a principle historically rooted in the people’s DNA as resurgent hope. Portraits for Self Determining Haiti is an exhibition of vibrant photographs of Haiti, three weeks after the 7.0 earthquake that killed more than half a million people. Elemental themes of faith, dignity, honor and respect are keenly displayed. The title is inspired by a series of essays published by The Nation in 1920 entitled “Self-Determining Haiti” written by James Weldon Johnson, a journalist, lyricist, and renowned civil rights leader of Haitian heritage. In Ways of Seeing, John Berger states “…every image embodies a way of seeing, our perception or appreciation of an image depends also upon our own way of seeing.” The world psyche is awash in distorted narratives of Haitian people and society, and Romain’s acts of visual resistance stoke the collective imagination and keep new ways of seeing alive. Regine Romain’s photo essay on Haiti, including photos from Portraits for Self Determining Haiti, is featured in Meridians, Vol 11, December 2011, a journal published by Smith College, which are available for purchase at the artist’s reception. She is also the editor of Diaspora Diaries: An Educators Guide to MoCADA Artists. 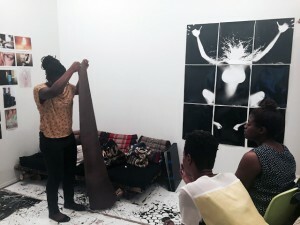 Regine Romain’s work has been exhibited at A.I.R. Gallery, NY; Watergate Gallery, DC; Artomatic, VA; Schomburg Center for Research in Black Culture, NY; Teatro Nacional de Cuba, Cuba; UN Photography Society, NY; and the Charles Sumner Museum, DC. Her awards include A.I.R. Gallery 2011-2012 Fellowship, Brooklyn Arts Council and the Trude Lash Fellowship. 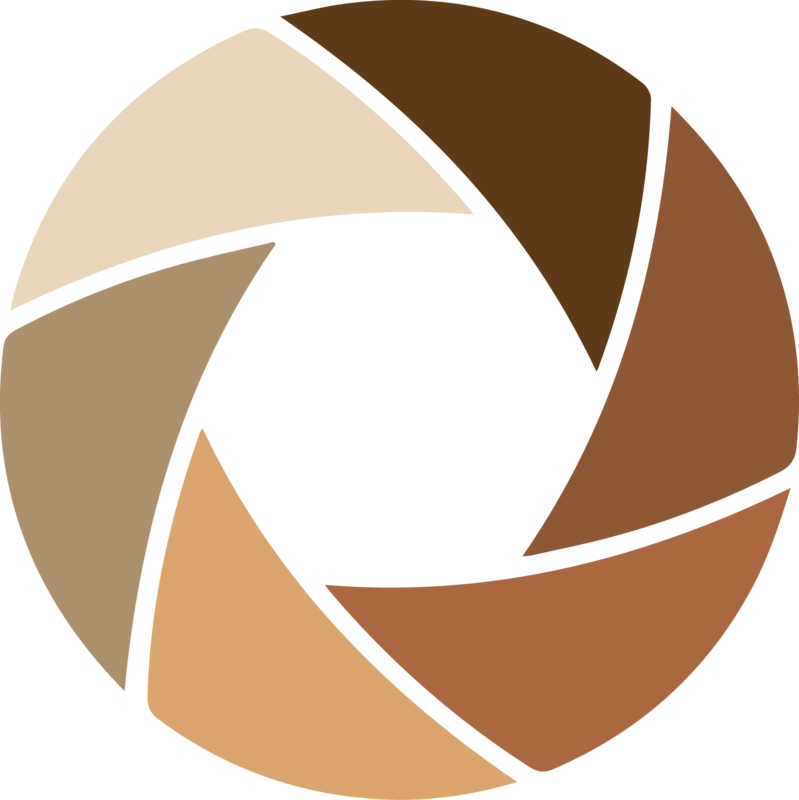 Régine Romain is the Founder and Director the Urban PhotoPoets project, the Brooklyn Photo Salon and Mami Wata Healing Arts. Regine Romain is a native Washingtonian and received her Bachelor of Science in International Studies from Bowie State University. In 2008, she acquired a Masters in Photography & Urban Culture from Goldsmiths, University of London. Regine Romain lives in Brooklyn, New York with her daughter. Clover’s Fine Art Gallery is located at 338 Atlantic Avenue, Brooklyn, NY 11201, three blocks from the Hoyt-Schermerhorn station on the A/C/G lines. Gallery hours: Wednesday through Sunday, 12 – 6 pm.